Johnny Riles is having a bad day. Actually, more like a bad decade. Someone shot his horse, he lost digits to a blizzard, and his brother is a soon-to-be-semi-famous-mistake. In Colorado author, Gregory Hill’s, second novel, “The Lonesome Trials of Johnny Riles”, (Leapfrog Press, 2015) he explores the hard and strange rural life of a small ranch owner in 1975. But it’s not your typical western. Hill paints the landscape and people with realism that, in itself, is romantic if not quirky. But the book delves into a darker world as we see Johnny Riles’ daily grind and earthy constitution hide a deeper ark of “animals” running wild in his mind. The book is his story; an older brother who took cuffs from his father, watched and fell into the alcoholic footsteps of his mother, and was pushed into the shadows by his semi-pro basketball player brother. He drinks to drown out the demons and disappointments that plague him and teeters on suicidal tendencies. The book begins with a slow trot into a blinding blizzard in search of his horse. The violent loss of his trusty mare catapults the audience into an ever-quickening plot of mysterious caves, rambunctious tiny dogs, strange and hardened hermits, cocaine dealers, and the sweet disparity of a man tied to his land and his cows in the storm of events swirling around him. Hill engages the reader in the dynamic world of the 1970’s. The emergence of professional basketball and all its swanky trappings that define his younger brother, Kitch, contrast with the simple and rural landscape that Johnny is bound to. The accumulation of outside forces that seem to both heal and hurt our hero comes to a head in an ancient system of caves. The end left me with some frustration, but perhaps Hill, like Johnny, wanted the readers to find out for themselves if Johnny's story ends in hope or hopelessness. Hill is a dialogue artist, sculpting his characters with depth and the pitfalls of humanity. He builds scenes with down-to-earth richness that made me picture my home state of Wyoming and calls to mind the small ranchers I know and love. 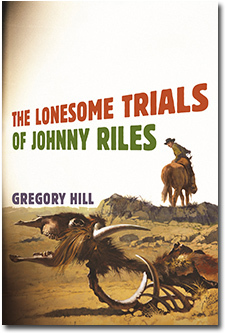 The Lonesome Trials of Johnny Riles is a rich and complex western that crosses over into the shady depths of noir fiction. It’s a stunning read, especially for the soon approaching Colorado winter. Just keep track of your horses, and don’t lose any fingers. Sounds great! I've put it on my list. Thanks for the recommendation.